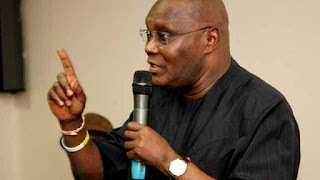 Former vice-president of Nigeria, Atiku Abubakar, has criticized President Muhammadu Buhari, over his comments on the young people in Nigeria. Atiku, writing on his Twitter page on Thursday morning, said, “our greatest asset is our youth”. “I will never refer to Nigeria’s youth as people who sit and do nothing. They are hardworking. I should know, I have thousands of youths working for me all over the country who have been the backbone to our success. “I’ve always said oil is not Nigeria’s greatest asset. Our greatest asset is our youth who created Nollywood out of nothing and an entertainment industry that is second to none in Africa. Buhari, speaking at the Commonwealth Business Forum in Westminster on Wednesday, said youths prefer to do nothing because they feel Nigeria is an oil-rich nation. According to Buhari, a lot of Nigerian youths have not been to school, yet they want everything free.